In April we are reading Marcel Duchamp’s The Creative Act, a paper he presented in April 1957 at a session of the American Federation of Arts in Houston, Texas. Listen to a recording of this talk at UbuWeb. The discussion will be chaired by F. D. and Penelope Kupfer will contribute in the role of respondent. DOWNLOAD: Duchamp, Marcel (1957). The Creative Act. Published in The New Art, Gregory Battock ed. New York: E. P. Dutton & Co. Inc. pp. 23-26. 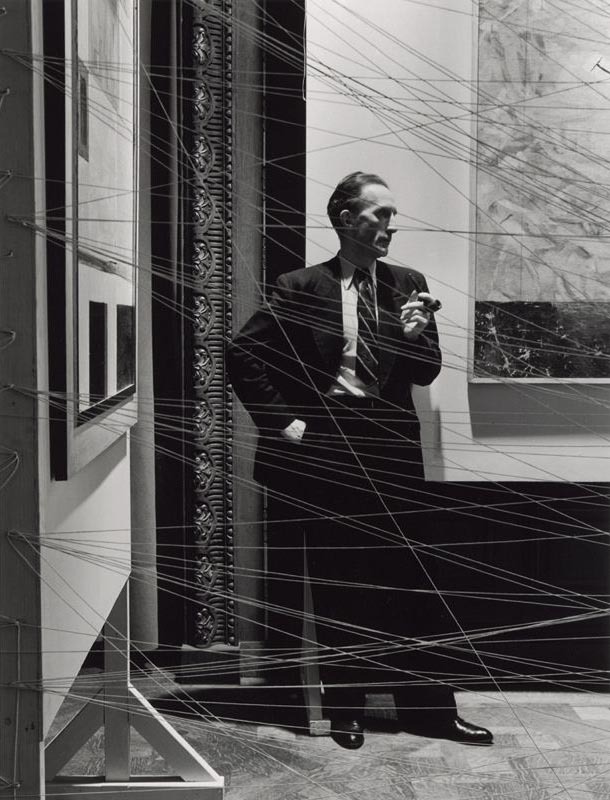 Marcel Duchamp  Behind Mile of String. First Papers of Surrealism, New York. Photo by Arnold Newman. De Duve, Thierry (1990). Authorship Stripped Bare, Even. RES: Anthropology and Aesthetics No. 19/20 (1990/1991), pp. 234-241. Haladyn, Julian Jason (2015). On ‘The Creative Act’. Toutfait, 1 Apr 2015. Kahneman, Daniel (2011). Thinking, Fast and Slow. New York: Farrar, Straus & Giroux. Ranciere, Jacques (2009). The Emancipated Spectator, trans. Gregory Elliott. London: Verso. Sontag, Susan (1961). Against Interpretation. In Against Interpretation and Other Essays, New York: Dell, pp. 3-14. Koestler, Arthur (1975). The Act of Creation. London: Picador.